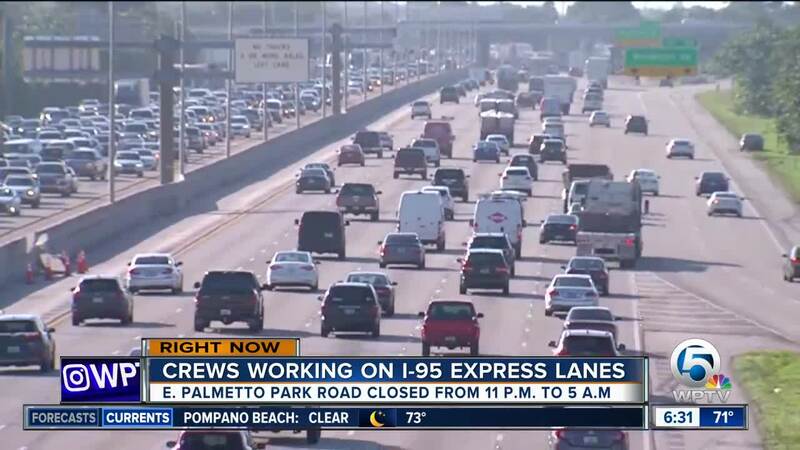 Road crews in southern Palm Beach County are a working on express lanes in southern Palm Beach County, causing overnight roads closures on East Palmetto Park Road. BOCA RATON, Fla. — Drivers in Boca Raton should be aware of overnight road closures on eastbound Palmetto Park Road for the next few nights. Construction crews are working to widen Interstate 95 for express lanes in the area, prompting the closures. The city said eastbound Palmetto Park Road at I-95 will be fully closed from 11 p.m. to 5 a.m. from Jan. 22 to Jan. 24. Drivers should plan ahead. Detours will be in place. Two express lanes will eventually be added from Glades Road to Linton Boulevard. The plan is to create two express lanes using one of the existing HOV lanes and widen I-95 to keep the existing number of general use lanes.